Inside this month’s On Call newsletter, more public safety highlights made possible by good Arlington community/police partnerships. 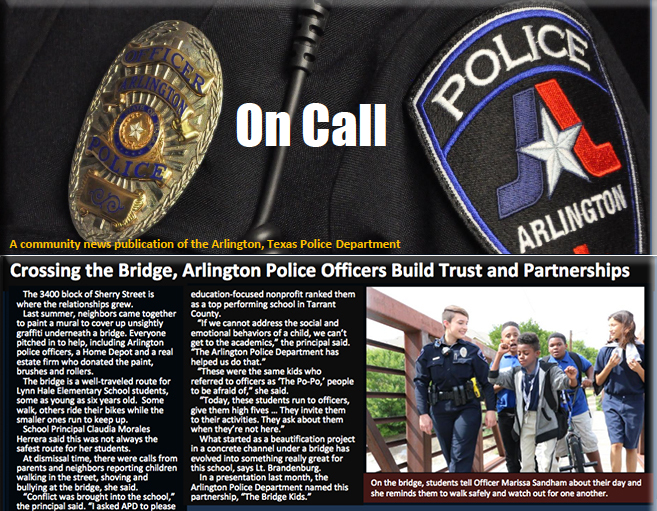 On Call is published monthly by the Arlington Police Department Media Office. • Genuine and Substantial Duty. Your charity work has to be real and substantial throughout the trip. You can’t deduct expenses if you only have nominal duties or do not have any duties for significant parts of the trip. • Value of Time or Service. You can’t deduct the value of your time or services that you give to charity. This includes income lost while you serve as an unpaid volunteer for a qualified charity. • Travel You Can Deduct. The types of expenses that you may be able to deduct include: o Air, rail and bus transportation, o Car expenses, o Lodging costs, o Cost of meals, and o Taxi or other transportation costs between the airport or station and your hotel. • Travel You Can’t Deduct. Some types of travel do not qualify for a tax deduction. For example, you can’t deduct your costs if a significant part of the trip involves recreation or vacation.